I was always the one to say Las Vegas is overrated and I wouldn't go unless I had to. But, my kids, my daddy, and I made it a trip we wouldn't forget. I thought it was going to be a trip with just my daddy and I, but I thought it would be more active and adventurous with Gabriel and Raphael. It was the best decision to make this into a family trip. Las Vegas has food, entertainment, history, a ton of things to do with kids. I wanted us to feel like we were at home when we came to Las Vegas. We needed the space, amenities, and a quiet place. Desert Paradise Resort isn't too far from the strip, and the condos here were just what we needed. Two bedrooms, two full bathrooms, a full kitchen, wash room, dining and living room was about $100 a night. Not too bad of a steal right? I woke my dad and kids up early in the morning, got breakfast and took a 4-hour drive to Page, AZ. It may have been a long drive, but the scenery was AWESOME. My dad and I stayed up the whole drive there and back, conversing, listening to music from when I was a kid, and taking pictures. On the trip there and back the kids were sound asleep. While driving, we saw rapids, mountains, falling rocks, canyons, and even the Glen Canyon Dam. Make sure you wear sunscreen, walking shoes, have a towel, and plenty of water for the Lower Antelope Canyon Tour. I knew Las Vegas wouldn't let me down and not have a children's museum. 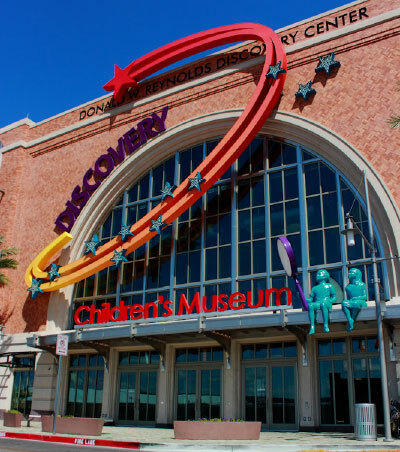 Discovery Children's Museum is about 6 miles away from the strip and is affordable. This museum has three levels of fun, one level has interactive entertainment, another has where kids can build things out of Legos, paper, etc., and a level that has water works. Be prepared to climb, help put Legos together, and get a little wet. Las Vegas Mini Gran Prix brought back so many memories from when I was a kid. Gabriel and Raphael enjoyed this place. So many things to do here, play arcade games, drive go-karts, ride on the carnival rides, and eat delicious pizza. Las Vegas Mini Gran Prix is so affordable; I believe I spent $7 to play all the arcade games we wanted to play. I'm happy I was able to find this little gem. We ended our last night with a little competition, bowling, one of our favorite things to do. Red Rock Casino Resort and Spa is filled with of course a bowling alley, movie theater, resort, spa, restaurants, and a shopping mall. This was when I told myself I would come back to Las Vegas and stay at Red Rock Casino Resort and Spa. All of us played two full games and were tired. Bowling with my kids and my daddy brought them to interact more with each other, especially on a competitive note. Red Rock Lanes was more of a luxury bowling alley, they're kinda expensive, but on the other hand very fun. How was your trip to Las Vegas? Do you take your kids? To get resources and read more about our trip to Las Vegas, download your Free Guide to Las Vegas With Kids. Get tips, tricks, and updates on our travels.